McClain Bank is proud to be Oklahoma-owned and operated for almost 90 years. 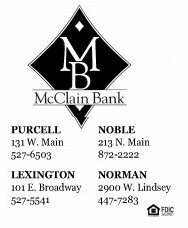 We are committed to providing complete financial services to those families, businesses and organizations that are located in the communities we serve.McClain Bank was originally chartered in 1922, and has been owned and operated by the Sherman Family since the mid-1950's. The Sherman's have been life-long residents of the Purcell area. The bank has assets of nearly $165 million and maintains five offices located in McClain and Cleveland Counties.The past 85 years have come and gone. McClain Bank has experienced a growth trend in all areas. This has lead to increased assets, additional employees and advanced technological skills. We are now looking to the future, adding improved electronic banking abilities for our business and individual customers. We also offer other financial services to our customers such as financial planning and insurance products. And we will continue to seek out other services that we may furnish to our customers. We look forward to providing those services to you as a customer of McClain Bank. ⇐Previous Mattocks PrintingNext⇒ Red Baker Propane, Inc.